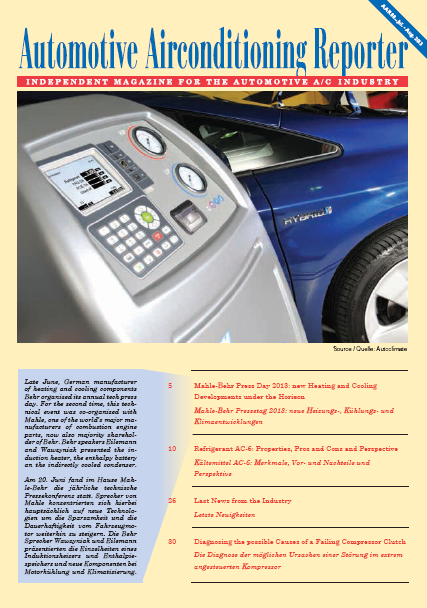 Europe's magazine for the independent auto a/c service industry! Edited in four languages ( incl. english), distributed in 50 countries. Updates you on technical subjects, new products and equipment, auto a/c service and diagnostics, system and equipment innovation, original system tips, workshop service tips, technical trends etc. Frequency; 5-6 issues per annum. Typical readers: Auto A/C Service Specialists, Distributors, Manufacturers, Trainers, Vehicle A/C Engineers, Industry Suppliers.